Losing weight can be hard – so hard that 95% of dieters either fail to reach their target weight or regain all the weight that they lost within a few short months. Some dieters end up regaining more weight than they lost in the first place. Over a series of unsuccessful diets many even manage to diet themselves fatter. Why such a poor success rate? Whatever the reason, just five percent of dieters reach and maintain their target weight, which is hardly good news when you consider that two-thirds of people in the U.S. are overweight and one-third are obese. Healthy eating and exercises CAN help you lose weight if you follow a sensible plan and stick to it – not just for a few days or weeks, but for as long as it takes to lose and then maintain your weight. There are, however, some supplements and other diet products that are designed to make weight loss easier. One such product is Fit Tea®. Fit Tea® is a blend of several different organic ingredients meant to speed up your metabolism (for faster and easier weight loss), suppress your appetite, give you energy, boost your immune system, and improve digestion. Fit Tea® is available in loose leaf, individual teabags, and stick packs. Fit Tea® also makes a range of other products including Fit Coffee and other fat loss supplements. The focus of this review is the original Fit Tea®. What are the Ingredients in Fit Tea®? Fit Tea contains 13 different ingredients. All the ingredients are certified organic and have been selected for their fat-fighting, metabolism boosting or energizing qualities. Many of the ingredients have been used in Asian cultures for centuries and are known for their healthful effects as well as being fat loss aids. Because Fit Tea® is a blend, it is not possible to say exactly how much of each ingredient is present in a serving and, in all likelihood, each serving will contain slightly differing amounts. Rooibos – Rooibos is an African red tea that is packed with antioxidants and other healthy nutrients. It has not specifically been linked to weight loss but may help lower blood glucose levels which can lead to more stable energy levels and reduced hunger. Green tea – Loaded with polyphenols like flavonoids and catechins, green tea is an excellent source of antioxidants and other healthy nutrients. It also contains caffeine and other ingredients frequently linked to increased metabolism and faster fat loss. Green tea is one of the most common ingredients in fat loss products. Ginger – Known for its anti-inflammatory effect, ginger can help reduce tummy bloat and stomach upsets. One study also suggests that is can be helpful for weight loss. Oolong – Like green tea, oolong contains caffeine, which can help increase the mobility of fat cells, making them easier to use for energy, and boost metabolic rate. Studies reveal that consumption of oolong can increase total daily energy expenditure, which could lead to faster fat loss. Pomegranate – While not linked specifically to fat loss, pomegranate is very high in antioxidants and other healthy ingredients. It’s also known for having a strong anti-inflammatory effect, improving blood flow, and increasing energy. Stevia – A natural, calorie-free sweetener, stevia comes from a South American plant. As well as making Fit Tea taste sweeter, stevia has some health benefits including reduced LDL or bad cholesterol and reduced blood glucose levels. Guarana – High in caffeine, guarana is a common ingredient in many weight loss supplements. Its effects are mostly limited to acting as a stimulant, which increases metabolic rate. Citric Acid – A natural preservative with no known weight loss benefits. Sea Salt – Sea salt contains iodine, which may help increase thyroid function for faster fat loss. Sea salt is also high in electrolytes which are minerals commonly lost through urination and perspiration. Lemon juice – A good source of vitamin C, lemon juice also helps give Fit Tea its refreshing flavor. Honey – Another source of sweetness and flavor in Fit Tea. Matcha – A variety of green tea, matcha is grown and prepared differently than regular green tea and is best thought of as a green tea concentrate. Like regular green tea, matcha is considered very healthy and contains caffeine and is high in healthy antioxidants. Garcinia Cambogia Extract – A source of Hydroxy Citric Acid (or HCA), Garcinia Cambogia extract is believed to block the conversion of carbohydrate into fat and may also reduce appetite. Studies show that HCA may lead to faster fat loss. While individually, many of these ingredients are linked to fat loss, no studies exist that demonstrate the effectiveness of Fit Tea itself. The list of ingredients in Fit Tea® is impressive. Almost all of them are, in some way or another, linked to fat loss. You’ll be hard pressed to find any weight loss product that doesn’t include green tea, HCA, or guarana, for example. Other ingredients such as ginger and pomegranate are also undoubtedly good for your health. And the healthier you are, the more likely you are to burn fat and lose weight efficiently. The fact that all the ingredients are organic is also a selling point. However, a two-gram serving of Fit Tea® cannot possibly contain very much of any of these ingredients and certainly not the amount that was used in many of the studies that showed they might be beneficial ingredients for weight loss. Each of the ingredients will only remain active in your body for 4-6 hours, so that single morning serving will have limited impact on metabolism and appetite suppression later in the day. Because Fit Tea® is a blend, it is impossible to know how much of each ingredient is in each serving. The ingredients are listed from greatest to least, but the amount of each ingredient per serving is not revealed. Several ingredients contain caffeine and caffeine is strongly linked to increased fat burning and mental and physical energy. Budget Alternative: Plenty of other calorie-free sources of caffeine, such as black coffee and regular tea, cost a fraction of the price. Speaking of price, Fit Tea® is not cheap and costs close to $2.00 per serving. That’s a lot of money when you consider you could buy 20 green tea bags for just a few dollars. Yes, you do get a blend of exotic ingredients, each one of which may help you lose weight, but you really don’t get much of any of them. Fit Tea® is also sold as a detox product. It detoxes by acting as a mild diuretic, which means it makes you urinate more than normal. The urinary system helps remove toxins from your body, so increasing urine output could theoretically lead to increased detoxification. However, caffeine is considered by many to be a toxin. Fit Tea® contains quite a lot of caffeine, so the detoxifying claims seem somewhat out of place. It’s also important to note that most foods, tap water, many toiletries, and even the environment itself all contain toxins. In all likelihood, drinking a tea that contains a little pomegranate extract, rooibos, or oolong will not have much of a noticeable detoxifying effect. Will Fit Tea® help you lose weight? Its effect is overhyped considering the amount of the ingredients you end up ingesting. To see any benefit from Fit Tea®, you will also need to decrease your food intake, eat more healthily, include exercise in your weekly schedule, and drink plenty of water. In truth, these are the very things that so many people find hard to do in the first place. However, starting your day with a cup of Fit Tea® could give you the impetus you need to exercise and eat well. It will give you energy and may even suppress your appetite a little. In truth, a cup of regular green tea will probably be just as effective at a fraction of the price. Fit Tea® gets some very mixed reviews. Some people love it and are adamant it has helped them lose weight while others have branded it useless. 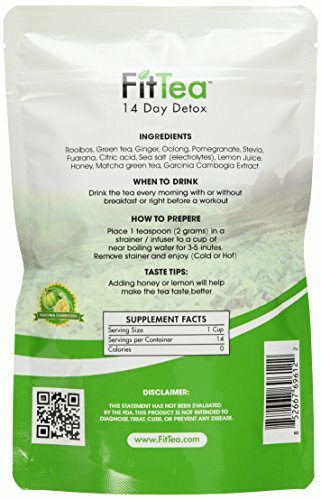 On Amazon.com, always a good barometer of consumer opinion, Fit Tea® earns a very average rating of 3.2/5 stars, and while 44% of users award it the full five out of five, 26% of users only award one. Alyssa on Lifestyleupdated.com says: “I wasn’t sure about this product at first, but I thought I’d try it. I usually eat healthy and I work out three times a week, but I never could get rid of side belly fat no matter how hard I worked out. Fit Tea really has helped me! It made me feel energized but to an extent. I always get tired in school, even with sleep, and I always crave food right as school ends but Fit Tea has helped me maintain it. It helped clean out my digestive system. I feel amazing. By day two I could tell a difference in my stomach, from the water weight of course, but this tea did wonders for me! Definitely going to make another purchase, recommend this to people out there wanting to lose those few extra pounds. Fit Tea is very easy to use and, depending on which type of Fit Tea® you choose, there are three ways to make it. For Fit Tea® Teabags: Place a teabag in an empty cup and then cover with hot water. Leave for three to five minutes, remove the teabag, and drink. For Loose Leaf Fit Tea®: Put about a teaspoon (2 grams) of Fit Tea® into an individual strainer and place in a cup. Fill the cup with hot water and leave for 3-5 minutes. Drain any excess liquid into the cup, discard the strainer, and drink. For Fit Tea Sticks: Open the stick package and place the contents in a cup. Fill the cup with hot or cold water. Stir until fully dissolved, and drink. Fit Tea® can be consumed hot or cold. Add honey or lemon to taste but be aware that adding honey increases the calorie content of your drink. The makers of Fit Tea® recommend that you drink one cup of Fit Tea® per day, preferably first thing in the morning. Combine with regular exercise – 3-5 times per week – and healthy eating. You should also stay hydrated by drinking plenty of water.